Electromagnetism is one of the great powers that human use everyday in several uses. In the year 1812, Michael Faraday (1791-1867) the English chemist and physicist was able to reach for the fact of the electromagnetic field. In the year 1820, Hans Christian Ørsted (1777-1851) the Danish chemist and physicist was able to reach for a great discovery that the magnetic current are a result of the electric current. He reached that conclusion when he noticed that the compass needle get distracted when exposed to electric current. André-Marie Ampère (1775-1836) the French mathematician and physicist that was able to figure out the amper, the measuring unit of electricity. In the year 1820, after few days from Hans Christian Ørsted discovery, Ampère had reached to the same relation between electricity and magnetism. 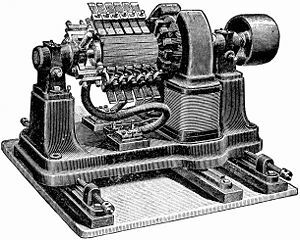 In the year 1832, Hippolyte Pixii (1808-1835) a French machines maker used the concepts of Michael Faraday and was able to manufacture the Dynamo. The Dynamo convert mechanical rotation to electricity depending on the electromagnetic theory. In the year 1873, James Clerk Maxwell (1831-1879) the Scottish mathematician and physicist was able to combine electricity with magnetism along with the light in a theory. He reached that all of electric, magnetism and light fields travel through space in the form of waves. In the year 1886, Heinrich Rudolf Hertz (1857-1894) the German physicist, he explained and proved the electromagnetic waves that James Clerk Maxwell suggested. In the year 1905, Albert Einstein (1879-1955) the famous German-American physicist reached for the special theory of relativity.